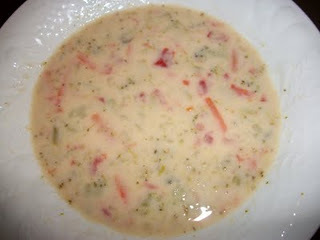 Here is another broccoli cheddar soup I found in a Gooseberry Patch Christmas cook book. Very tasty! I am always looking for yummy soups to add to my collection. I added a little bit of chopped tomatoes and some carrots to the soup so I could get my veggies in. You can leave those out if you like. Enjoy!